“A Transformed Ugandan Society from a Peasant to a Modern and Prosperous Country within 30 years”. This here piece will be the important and special words and numbers from this report that has had a release date the same as budget for financial year 2015/2016. This is important to address to show what the draft of 3rd March 2015 is saying. If the numbers has changed then the government should drop and show the world the updated NDPII. But that hasn’t surfaced anywhere. Therefore I will drop the numbers and quotes I do have. It will be a long piece. But this is a big plan with enormous sums of monies in play. So with that play you got show what the government really want to do. I have already showed the dream-piece or press release earlier this week. So this here will see if that has changed or not. The pages where the quotes are from are not direct pages because the page number is different in an pdf so the empty pages also get counted. Just to explain that. “This National Development Plan (NDPII) is the second in a series of six 5-year Plans aimed at achieving Uganda Vision 2040” (…) “The Plan also seeks to leverage opportunities and honour obligations presented by emerging developments at the national, regional (East African Community (EAC), and the Africa Agenda 2063), and global levels (the Post 2015 Development Agenda)” (P: 12). “This Plan prioritizes investment in three key growth opportunities including Agriculture; Tourism; Minerals, Oil and Gas as well as two fundamentals: Infrastructure and Human Capital Development” (P: 13). “The Public Debt-to-GDP ratio is currently (2013/14) at 26.14 percent and is projected to peak at about 42 percent in 2019/20, but will remain below the 2013/14 debt strategy threshold of 50 percent throughout the projection period. The debt is however still highly sensitive to non-concessional borrowing, given the current structure of external debt” (P: 32). “Commercial Banking and Microfinance: As of April 2014, Uganda had 26 licensed commercial banks, with about 544 branches and 5.5 million accounts. The commercial banks hold about 80 percent of the total assets of the financial system and the NSSF holds almost the remaining 20 percent. Savings are still low despite measures to increase savings in the past which included: NSSF improving its return on savings; starting the financial literacy project; URBRA putting in place a framework to enable the informal sector to participate in formal saving schemes; and having SACCO‘s empowered to mobilize savings. SACCOs and MFIs are still experiencing weaknesses in regard to their sustainability, due to the low mobilization of savings from the public, partly due to the over dependence on Government through the Uganda Micro Finance Support Centre and also the fraudulent activities that are a vice to the people‘s savings” (P: 36). “Uganda‘s capital markets are characterized by under capitalization and limited investment opportunities. The Stock Market remains thin, with only 16 companies listed on the Uganda Securities Exchange (USE). Equity markets are poorly developed and only large and well established firms can realistically raise finance on equity markets” (P: 37). “Generally, during the NDPI period the paved road stock increased at an average rate of 123km, lower than the targeted increase of 220km per year” (P: 42). “The rail infrastructure has not changed over the last 5 years. The current rail network comprises of long meter-gauge rail lines, running from the east to the west of the country. Its operations are limited to 640 km between Kampala-Malaba, Kampala–Port Bell, Kampala-Nalukolongo and Tororo-Gulu, while the rest of the network is defunct” (P: 42). “Currently, only 2 percent of water is used for production, with only 1 percent of potential irrigable area, where 15,000Ha out of 3,030,000Ha is under formal irrigation. Access to water for livestock at present is estimated at 48.8 percent. The country is increasingly facing a major challenge of prolonged droughts and unexpected floods due to climatic change and variability and is predicted to be water stressed by 2025” (P: 44). “Financing Health Services: The trend in allocation of funds to the health sector shows an average increase of 20 percent per annum in absolute terms over the past four years of HSSIP. However, the allocation to health as percentage of the total Government budget has reduced from 9.6 percent in 2003/2004 (AHSPR, 2013/14) to 8.6 percent in 2014/15 of the total Government budget much lower than the Abuja Declaration target of 15 percent. This decline has taken place in the midst of rising health care demand and costs due to high population growth” (P: 48-49). “Pre-Primary Education: The net enrollment at pre-primary level stands at 10.1percent (EMIS 2013). The provision of pre-primary education continues to be dependent on NGOs, multilateral organizations, and the private sector. This limits access with high disparities between urban and rural areas and among different socio-economical levels” (P: 50). “Primary Education: The implementation of UPE program since 1997 resulted to increased access from 2.5 million to 8.5 million in 2013. The Pupil/Book ratio has stagnated at an average of 4:1 from 2009 to 2013. The repetition rate reduced from 11.7percent in 2009 to 10.3percent in 2013” (P: 50). “Secondary Education Sub-sector: The Student/Classroom Ratio (SCR) improved from 68:1 in 2009 to 57:1 in 2013 (EMIS 2013). In 2013, Government owned secondary schools were 1,019 (36 percent), private schools were 1,819 (64 percent). Enrolment in Government secondary schools is 669,225 (49 percent) and it is 693,514 (51 percent) in private schools” (P: 51). “Higher Education: Total student enrolment in higher education increased by 26percent from 183,985 in 2010 to 232,612 in 2013. Universities continue to enrol the majority (67.3 percent) of post-secondary students (156,747) as of 2013. 60 percent of these are in Public Universities. The private providers cater for the remaining 40 percent” (P: 51). “Economic development and transformation cannot thrive if citizens and investors have no confidence in the rule of law and the justice system” (…) “Good governance provides a setting for the equitable distribution of benefits from economic growth. The Constitution requires that the State promotes balanced development for all regions of the country, between rural and urban areas. 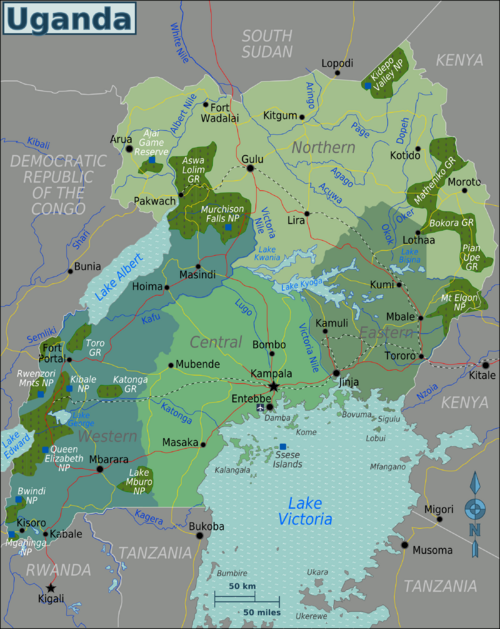 It also requires the State to take special measures to develop Uganda‘s least developed areas and to pay special attention to the problems of the marginalized” (P: 57). “The Government of Uganda has adopted the Zero Tolerance‖ to Corruption Policy (2009). The policy correctly recognizes that fighting corruption requires measures beyond legislation and sanctions against corruption. It also requires restoring public sector ethics and creating behavioural change” (P: 60). “However, international surveys, as well as nationally representative data indicate that corruption in Uganda remains a major problem. The East African Bribery Index (EABI, 2013) found that 82 percent of respondents in Uganda described the current level of corruption as high, while 10 percent perceived it to be medium (Transparency International, 2013)” (P: 61). “Uganda is destined to benefit from the opportunities explored along the minerals, oil and gas development value chain by addressing a number of challenges and emerging issues involved in minerals and petroleum development” (…) “The petroleum sub-sector is challenged by: inadequate industry infrastructure to support upstream petroleum activities; excitement and high expectations from the general public; lack of skilled manpower, both in the public and the private sectors; inadequate financing; land acquisition for infrastructure development for oil prospecting; and low institutional preparedness; huge capital requirements and technical expertise needed for projects; inconsistent fuel supply leading to scarcity of petroleum products; and absence of a legal framework and associated technical capacity to regulate and minimize the attendant environmental risks” (P: 71). “There are over 6,351 registered SACCOS with savings of over UGX 120 billion, total shareholding of over UGX 25 billion and loans of UGX 80 billion. Cooperatives have also been formed in other sectors of the economy. For example, 2 energy cooperatives are managing the distribution of energy, 10 housing cooperatives are at various stages of development” (P: 76). “The country still faces high levels of illiteracy. According to UNHS 2009/10, 6.9 million Ugandans (5.5 million women & 1 .4 million men) aged 15 years and above are non-literate – unable to read, write and numerate with understanding” (P: 83). “The financing for local governments has increased from UShs974 billion to over UShs2 trillion today” (…) “In general, LG staffing level is at 56 percent for the districts and 57 percent for the municipal councils – a state that has further constrained service delivery. Rapid urbanization characterized by an increase in urban centers from 28 in 1969 to more than 400 in 2013 (1 City, 22 Municipalities, 174 Town Councils and 207 Town Boards) has been without proper planning and facing declining resources. In addition, governance at LGs characterized by poor coordination between the technical and political leadership especially in newly created districts is hindering service delivery” (…) “This is mainly due to breakdown of social values, peoples‘ expectations of hand-outs from government and CSOs, mistrust of communities towards leaders due to persistent unfulfilled promises” (P: 84-85). c) A tax to GDP ratio of 25 percent” (P: 103). “The strategy highlights the key development outcomes expected under the NDPII, the interventions and resources required to achieve these outcomes. The strategy also provides a motivation for the sources of growth and the expected socio-economic outcomes” (P: 111). “The goal of this Plan is to attain middle income status by 2020” (P: 112). “Fiscal Expansion for Frontloading Infrastructure Investment: In order to realize the necessary public investment, government will harness concessional and semi-concessional financing and other development support facilities that are targeted to accelerate investment in infrastructure and human development, among others. Industrialization: To stimulate growth and employment, the country will promote value addition through agro-processing and mineral beneficiation as well as light manufacturing which have a higher multiplier effect on wealth creation. Fast Tracking Skills Development: In order to plug the current skills gap, government will establish five centers of excellence to rapidly build the necessary skills required in the key priority areas. Export Oriented Growth: Uganda‘s strategic location at the heart of East Africa makes it well placed to exploit the regional market. The region is increasingly becoming a fertile ground for small scale exporters, diversifying the export market and adding value to traditional export commodities. A Quasi-Market Approach: A Quasi-Market approach will be pursued in order to increase efficiency of the public sector and competitiveness of the private sector. With this approach Government will invest in key strategic infrastructure in order to remove the barriers of entry and increase private sector participation in the key growth areas” (P: 114). “Harnessing the Demographic Dividend: Uganda will implement policies aimed at accelerating a rapid decline in fertility and ensure the resulting surplus labour force is well educated, skilled, healthy and economically engaged in order to reap the demographic dividend. Urbanization: Uganda will implement a tripartite strategic policy aimed at accelerating planned and controlled urbanization, while ensuring the critical link between urbanization and modernization of agriculture where the urbanizing community frees land for commercial agriculture as well as create a market for the increased output and quality of agro products. Strengthening Governance: The key development results cannot be achieved without the necessary enabling environment. Meeting good governance principles which include: constitutional democracy; protection of human rights; rule of law; free and fair political and electoral processes; transparency and accountability. Integrating Key Cross-Cutting Issues into Programmes and Projects: The key cross-cutting issues of; Gender, HIV/AIDS, environment, nutrition, climate change, human rights, social protection, child welfare among others will be mainstreamed in the relevant programmes and projects during the implementation of the Plan” (P: 115). “For this Plan period, focus is placed on investing in the following agricultural enterprises along the value chain: Cotton, Coffee, Tea, Maize, Rice, Cassava, Beans, Fish, Beef, Milk, Citrus and Bananas. These enterprises were selected for a number of reasons including, high potential for food security (maize, beans, Cassava, Bananas); high contribution to export earnings (e.g. Maize – USD 21 million in 2005; coffee -USD 388 million in FY 2007/08; fish – USD 143 million at its peak; tea – USD 56 million in 2007)” (P: 120). “During NDPII the necessary institutional changes should be made so that a clear strategy for agro-processing can be developed and implemented. This should enable proposals for locating value addition facilities in the proposed zones” (P: 121). “The NDPII has prioritized investment in strategic tourism supportive infrastructure (expansion of Entebbe International Airport, construction of Kabale Airport in Hoima, upgrading of strategic airfields, construction and maintenance of strategic tourism roads, as well as, investing in water transport to support tourism activities” (P: 122). “The pumping of an estimated reserve of 3.5 billion barrels of oil, expected to start by 2017/18, portends great benefits for transport, energy, road infrastructure and public revenue” (…) “In the first year of implementation of the NDPII, a mineral development master plan containing the Country Mining Vision will be developed to implement the African Mining Vision. The Vision will clearly provide the detailed strategic direction and guidance for the mining, oil and gas during the NDP period and beyond” (P: 124-125). “Standard Gauge Railway System” (…) “A good railway system would effectively link Uganda to other countries within the East African region and to overseas. This is key to exporting, and importing for manufacturing and services at affordable/competitive rates via connections to Djibouti and Mombasa if we are to achieve the Plan targets” (P: 126). “Strategic Roads” (…)“For this Plan period, 1,500KM of gravel roads will be upgraded to tarmac, 700KM of old paved roads will be rehabilitated and 2,500KM of paved roads and 10,000KMs of unpaved roads will be maintenance” (P: 128) (…) “Energy Infrastructure: Government will invest in the necessary infrastructure to facilitate the exploitation of the abundant renewable energy sources including hydropower, geothermal, and nuclear, so as to increase power generation capacity from 825MW in 2012 to 2,500MW in 2020 and prepare for achievement of the required 41,738 Mega Watts by year 2040” (P: 130). “Oil and Gas: The pumping of this oil and gas is expected to start by 2017/18” (…) “The Government will commence construction of a 22-inch diameter, 1,300Km long oil pipeline from Hoima via Lokichar to Lamu in Kenya. This is in addition to the oil refinery that is to be constructed at Kabaale in Hoima to process petroleum and other products for the domestic and international market” (P: 131). ICT: “Over the Plan period, government will prioritize investment in the following ICT infrastructure: extension of the National Backbone Infrastructure (NBI) to cover most of the country so as to increase penetration of communication services; finalise the migration from analogue to digital terrestrial broadcasting” (P: 132). Human Capital Development: “the Plan will focus on providing early childhood survival and full cognitive development. Efforts will be geared at: reducing incidences of morbidity and mortality; scaling up critical nutrition interventions outcomes especially for children below 5-years; and implementation of Early Childhood Development (ECD)” (P: 134). “A skills development programme will be designed and tailored to the Industrial strategy, production zones and urban corridor locations that will be planned during NDPII. Provisions will be made for skills training on location at infrastructure construction sites to give unemployed young Ugandans rather than imported labour the maximum chance of personal development”(P: 135). “The NDPII assumes that all the interventions outlined in the strategic direction will be implemented during the period 2015/16-2019/20. 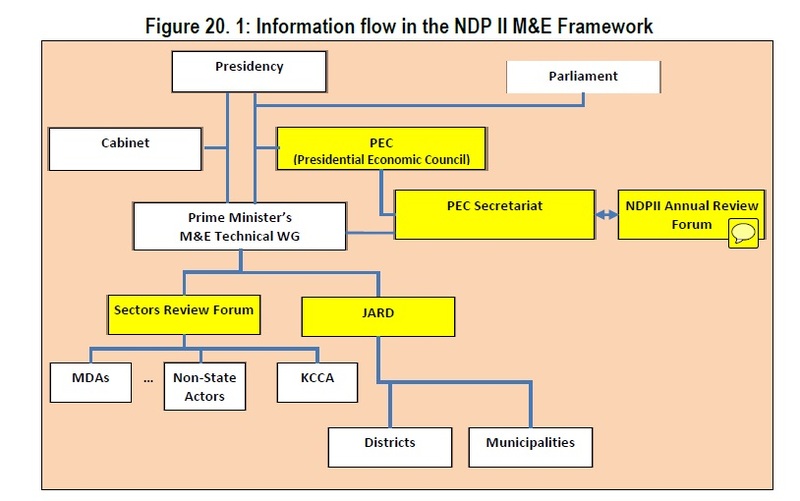 In particular, it is assumed that the following will be realized during the NDPII period: (i) increasing productivity of all sectors, (ii) pursuing value addition especially for the agro-processing and mineral products, (iii) creating an environment where industrialization can flourish, and; (iv) improving social delivery of services” (P: 139). “The fiscal strategy of the NDPII is underpinned by the need to maintain macroeconomic stability and a quest to competitively position Uganda to fully benefit from the East African Common Market” (P: 141). ”The focus of addressing the infrastructure deficit while consolidating the gains in human capital development remains a key priority for the NDPII. In summary, being that infrastructure has been prioritized; the fiscal deficit will mainly be driven by the additional resources required for infrastructure and human capital development” (P: 142). “The overall average spending is expected to be 21.1 percent of GDP with the peak of 22 percent of GDP expected in 2016/17, and consolidation of spending by the end of the Plan period” (P: 142). “On the revenue outlook, the NDPII envisages that there will be some improvement in domestic revenue mobilization (excluding oil revenues). These gains will arise from minimizing the use of non-standard VAT tax exemptions which have compromised the effectiveness of tax collection. These exemptions are estimated to reduce government revenue by 1 percent of GDP” (P: 144). “Grants under the NDPII period are expected to decline due to a combination of factors including: (i) austerity measures pursued in donor countries (ii) continued positive growth perception of donors about Uganda‘s recent developments and therefore not being eligible for certain grants. As a result grants are expected to decline further to 0.5 percent by the end of 2020” (P: 145). “The Bank of Uganda (BOU) has been implementing monetary policy under an Inflation Targeting Lite (ITL) monetary policy framework since July 2011” (…) “BOU will continue to implement a monetary policy framework that will ensure price stability and at the same time conducive in attaining economic growth over the NDPII period. The inflation outlook will be largely dependent on changes in domestic food prices, exchange rate and international commodity prices. Over the NDPII period, the objective is to keep annual inflation low and stable assuming no major shocks to the economy” (…) “The foreign exchange market: The import content of infrastructure investment in Uganda is estimated to be between 67 percent and 80 percent, but over 80 percent of the key infrastructure projects will be financed from external sources” (…) “Domestic liquidity and private sector credit: The impact of public investment on domestic liquidity will be limited due to the high import content of the infrastructure projects. Nonetheless, a higher fiscal deficit and foreign exchange purchases by BOU will create a liquidity injection that must be managed appropriately to maintain low and stable inflation and healthy levels of private sector credit” (…) “Credit rating: There is a risk that higher fiscal deficits over the medium term will reduce confidence in Uganda‘s public finances. This could lead to a downgrading of the country‘s credit rating and raise interest costs” (P: 149-150). “Concessional loans are defined as external loans contracted with a grant element of more than 35 percent mainly sourced from the bilateral and multilateral donors. Over the years these loans have cushioned Uganda to finance a moderate deficit. In 2014/15, concessional loans were projected to contribute up to 2.3 percent of GDP” (…) “Less than 50 percent of the financing needs will be met through concessional borrowing in 2013/14. Given this background, the NDPII relies on conservative estimates for concessional borrowing. It is expected that over the NDPII period concessional loans will remain a key source of financing in 2015/16 and 2016/17 and decline to 1 percent of GDP in fiscal year 2019/20 as the financing needs also decline” (P: 151-152). “Financing from semi-concessional loans especially for large infrastructure projects including Karuma and Isimba dams and the SGR are expected to total USD 5.3 billion during the period 2015-20” (…) “Under the NDPII Government will continue to source these types of loans given their favorable terms compared to commercial loans” (P: 152). “It is imperative that Government also starts exploring other options especially to finance large infrastructure projects whose economic returns may not be viable in the short run but with enormous social benefits. Uganda is currently rated at B by Fitch and Standard and Poors rating agencies” (P: 152). “Government started issuing securities for fiscal purposes in the year 2012/13 raising about UGX650bn (1.2 percent of GDP)” (…) “Given these challenges, the NDPII would attempt to limit domestic borrowing to current levels especially as the infrastructure projects get completed. The level of domestic debt would be limited to the range of 1.5-3 percent if domestic debt is to be contained within sustainable levels” (P: 153). 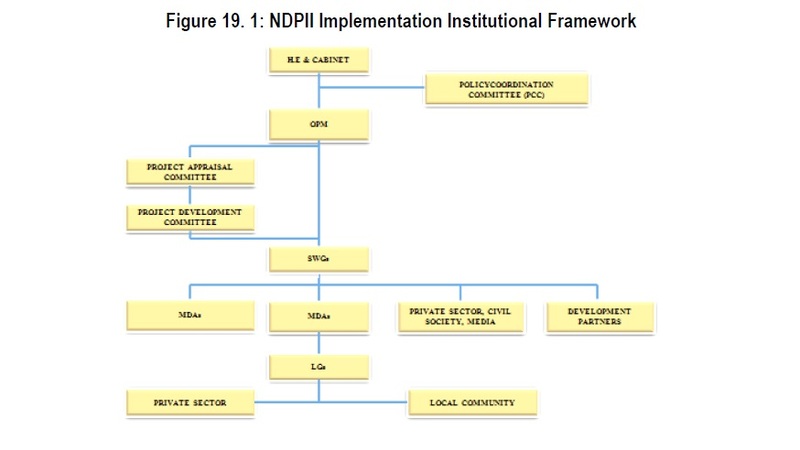 “Given the scale of investments required under NDPII, there is need to have close cooperation between the public and private sectors in form of public-private sector partnerships (PPP)” (…) “Government has already embarked on promoting and encouraging PPP in various forms for the smooth implementation of NDPII. Legislation towards formulating laws for PPPs is also in advanced stages. The forms that PPPs usually take include joint ventures between the Government and private sector entity/ies where both may contribute financial resources, Build, Operate and Transfer (BOT), Build, Own, Operate and Transfer (BOOT), Build, Own and Operate (BOO) and Concessions” (P: 153). “Under this financing strategy, all the solvency and liquidity external debt-burden indicators remained well below their policy-dependent thresholds throughout the projection period. The public gross national debt would peak at 42 percent of GDP in 2019/20 while the NPV is expected to peak at about 40 percent of GDP” (P: 154-155). This must be an eye-opener. It has already been a long article. I could have written my opinion on the matters and the whole NDPII. But I think the quotes speak for themselves. That if these don’t give you any indication on how the Government of Uganda hopes it turns out. They also told in this draft that certain aspects of the NDPI they didn’t succeed so if they don’t do it here. It shouldn’t be like a lightning strike from a clear sky. More like expected, this should be hard to achieve it’s a broad and general plan that has visions of all aspects of society from narrow industrial projects to infrastructure. That gives a lot of power and also a framework which is big. Therefore they need massive funding for this and already seen in other documents and in this that the scale of debt and loans is getting higher while the donor countries are offering less to the state coffers. Meanwhile the economy isn’t sustainably growing. While the Oil and Gas might cover for this that will still to be seen in 2017/2018 when the monies are expecting to recover. In the meanwhile the economy will drive itself on loans and hope for other funding. It’s already up to 40% of all budget concerns which is alarming. It should be, even if progression and analyzes say it can go up to 50% before the debt rate is too high. Even though that makes sense from an economic standpoint it’s still frightening to see the figures on how it has risen. And I wonder does the government have a constructive plan to pay this back to its creditors? Because that doesn’t comply here or anywhere else I have seen which is a little bit frightening. Peace.